Thankfully, it’s for a good reason. Remember the year 2000? Yeah, I don’t either, really. But back in the first year of the aughts, the presidential election came down to sunny little Florida, and a tiny piece of paper stood in the way of George W. Bush becoming president—for a short time. Ultimately, the U.S. Supreme Court halted a recount of the very close election, Bush became president, and the rest is history. But thanks to famously purple Florida, and the controversy that surrounded the recount, punch-card voting ballots were quickly discontinued, and now most voting is digital. That’s a whole other issue, but—I digress. Here we are, 18 years later, and Florida has once again been thrust into the political spotlight, but this time, thankfully, no chads are involved—hanging or otherwise. Yesterday, the stage was set for a fierce battle for governor when the mayor of Tallahassee, Andrew Gillum, was chosen in the primary as the Democratic candidate to run against Representative Ron DeSantis. If Gillum wins, he would be the first black governor of Florida. 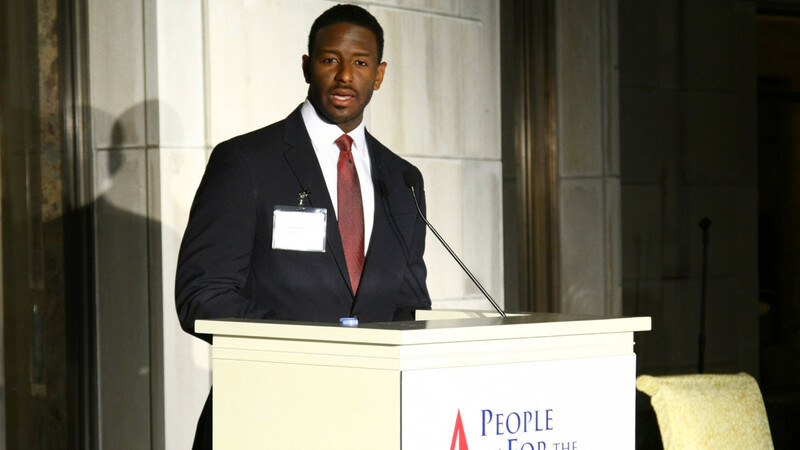 Gillum, an outspoken progressive, is up against a Republican who is outspoken too—in his support of Donald Trump. And so it begins. It has already started, and it’s not pretty. This morning, DeSantis spoke to Fox News and said Floridians should not “monkey it up” and vote for what he called Gillum’s “socialist agenda.” Though his campaign officials have since denied any racist intent in the candidate’s choice of words, his words were spoken—and if we’ve learned anything from the Trump agenda, it’s that he and his acolytes speak now, deny later. “It’s disgusting that Ron DeSantis is launching his general election campaign with racist dog whistles,” the chair of the Florida Democratic Party, Terrie Rizzo, said in a tweet. You know what else isn’t going to be good for Florida? Someone who uses that rhetoric in the role of governor. As Gillum put it today, “In the handbook of Donald Trump, they no longer do whistle calls. They’re now using full bull horns.” But he added that he won’t be stooping to DeSantis’ level anytime soon. “I’m not going to get down in the gutter with DeSantis and Trump,” he added. “I’m going to try and stay high.” If I lived in Florida, I know who I’d vote for.